My previous post about Live Tiles showed you how you can use a PeriodicTask to update your Application’s Live Tile periodically from inside the phone. Now we are going to move a little beyond Application Tiles and move towards Secondary Tiles. 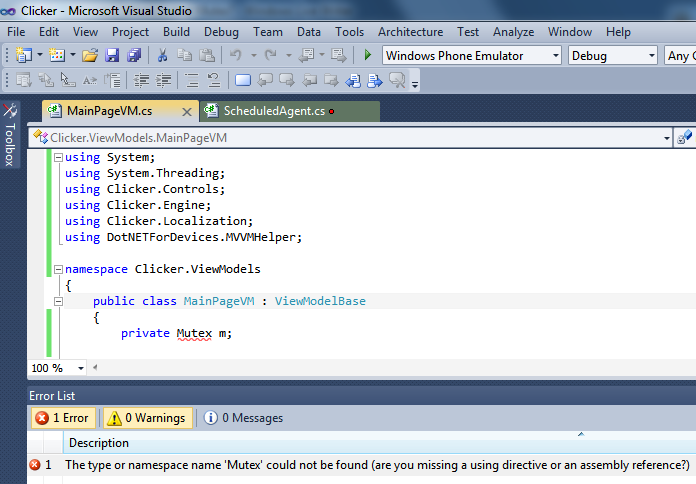 Matthijs Hoekstra, Microsoft’s Dutch Windows Phone Champ, inspired me to create the following sample application. The application creates a single Secondary Tile and that is about it. This application is great to make the number of tiles on the phone’s start screen even (which simply looks better). At the same time, the application has limited functionality, making it easier to concentrate on functionality that is needed to create and update the Secondary Tile. Each application can create multiple Secondary Tiles. These Secondary Tiles are created programmatically, and will be pinned on the user’s start screen after they are created. They do have the same properties and update possibilities as Application Tiles. However, an application always has an Application Tile, regardless from it being pinned on the start screen or not. Secondary Tiles are completely optional. 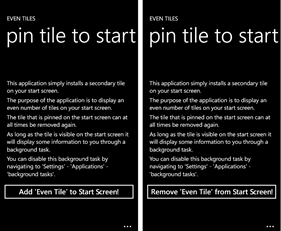 End users of course have the possibility to unpin the Secondary Tile again from the start screen, so you should not automatically assume that a Secondary Tile you created inside your application will live on the phone’s Start Screen forever. One important difference between the Application Tile and a Secondary Tile is the possibility for a Secondary Tile to specify a navigation URI. With this URI it is possible to immediately navigate to a particular page inside an application and / or to pass additional data to a particular page. Because users can unpin Secondary Tiles, it is not wise to only allow navigating to a particular page through a Secondary Tile, even though this would be technically possible. 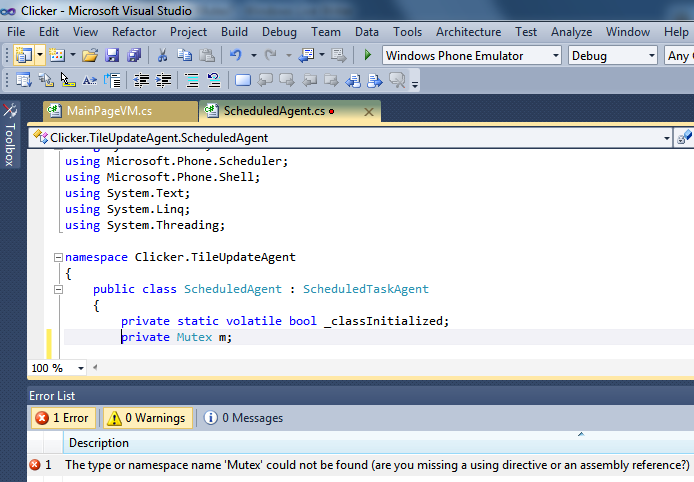 In the above code snippet we first check if the Secondary Tile currently exists. If not, a new Secondary Tile will be created containing both foreground and background information. The Secondary Tile also contains a Uri, containing the address of the MainPage, but it also passes additional data so we can determine if the MainPage was started from the Secondary Tile or not. If, on the other hand a Secondary Tile does exist, it will be deleted and the user has the possibility to create another Secondary Tile. As you can see, the ShellTile class is used to create or access the Secondary Tile. Identical to Application Tiles, the StandardTileData class is used to modify properties on the tile. In the next part of this series we will take a look at additional possibilities you have to update your Live Tiles. My previous post about Live Tiles showed you how to update the back side of the Application Tile inside an application. The big drawback of this approach is that your tile will only be updated as a result of your application being executed. Depending on the information you want to display on your tile, you might want to take another approach to update your application’s tiles. This time we will make use of a Background Agent to periodically update the Application Tile without the need for the application to actually run. We again work on the same sample application, Clicker, and extend its functionality by adding a PeriodicTask. A PeriodicTask is supposed to be lightweight and will run at fixed intervals. A PeriodicTask will not run forever, but it expires after at most 14 days. From within the running application, the PeriodicTask can be renewed before the expiration date. In this way, applications that are not used will not continue to use precious device resources through a PeriodicTask forever. Back to our tile though. The scenario we want to implement is the following. The backside of the tile already displays the high score. It would be nice to alternate between showing the game’s high score and showing the amount of time the game has not been played. To implement this functionality, a PeriodicTask is ideal. 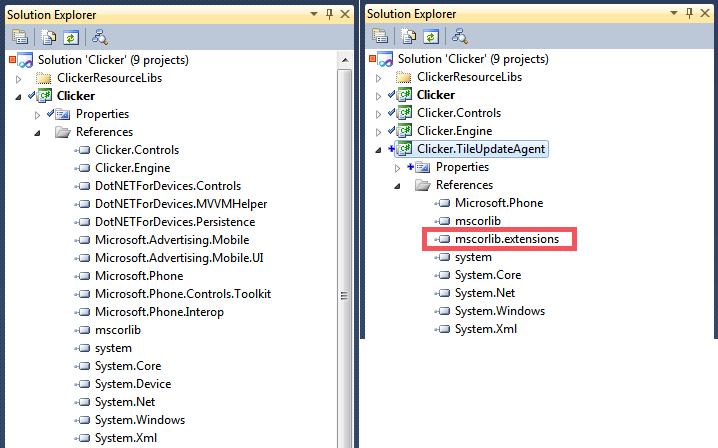 In order to make use of a PeriodicTask, a new project of type Windows Phone Scheduled Task Agent must be added to the solution containing the Clicker application. This newly created project already contains an OnInvoke method that is called each time the PeriodicTask executes. Inside the OnInvoke method, the back side of the live tile is updated. The PeriodicTask will execute approximately once every 30 minutes. It is important to determine how data can be exchanged between the application and the PeriodicTask. The PeriodicTask has access to the application’s IsolatedStorage. In Clicker, a file is used to save the high score, which in turn is read by the PeriodicTask. Since the OnInvoke method will execute on a thread and will be terminated after being executed, data needed for the PeriodicTask must also be persisted in IsolatedStorage. To store and retrieve high scores, a static class is available inside the Clicker application. This class will be used in the application to store high scores. The same class will also be used in the PeriodicTask to retrieve high scores. Together with the high score, also a boolean variable is stored, indicating if the high score or an informational message should be stored on the back of the Application Tile. The following code shows how the PeriodicTask is created / renewed and scheduled to update the Live Tile of the application. Description = "Periodic Task to Update the ApplicationTile"
To make debugging easier, the PeriodicTask will execute every 30 seconds in debug mode, instead of every 30 minutes. The other important piece of functionality is in the PeriodicTask itself. The OnInvoke method is started every 30 minutes (every 30 seconds in debug mode). It retrieves the information to be displayed on the back of the Application Tile. // Application Tile is always the first Tile, even if it is not pinned to Start. At the end of the OnInvoke method you will see a call to NotifyComplete. This call is important because it releases resources of the PeriodicTask. Omitting to do this means the PeriodicTask will not be rescheduled to run again after the specified interval in debug mode or after the fixed interval in release mode. My previous post about Live Tiles showed you how to use both sides of the Application Tile in Windows Phone Mango and how to initialize it in the WMAppManifest.xml file. You also learned how to add local language support. Now we will focus on how to update the Application Tile within your application. Even though this is considered to be a live update of the tile, the update is not triggered by a schedule. This means that the Application Tile for the sample application will not be updated spontaneously when you are looking at it on the start screen of your device. However, it will alternate between front and back side and it will show relevant information on the back. In order to show you how to update the Application Tile from within your own application, we again take the same sample application, Clicker, and extend its functionality. Each time the game is played, we will check for a new best time. If there is a new best time, it will be visible on the back side of the Application Tile, together with the date. In order to update an Application Tile, two steps are necessary. First you need to get access to the Application Tile. This is possible by retrieving the first tile from the generic IEnumerable collection of active tiles that belong to the application. The first tile is always the Application Tile. 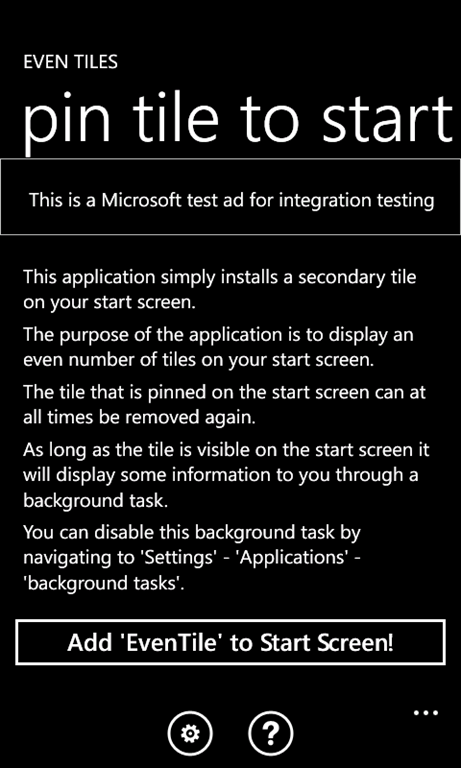 This tile always exists (even if the user has not pinned the Application Tile to the start screen). Optionally, one or more Secondary Tiles can also be part of the collection of Active Tiles. In order to easily get to a particular tile in the collection of ActiveTiles, methods on the Enumerable class can be called. Since this class is implemented in the System.Linq namespace, you must also add a using directive to System.Linq. Omitting to do so results in compilation errors. Assuming you have retrieved the Application Tile from the collection, you can modify it by creating a new StandardTileData class and initializing it with the data items that you want to change on the tile. It is sufficient to set only changed properties to an instance of the StandardTileData class. In our sample, we will only update the BackContent property, but it is also possible to change the entire appearance of (both sides of) the tile if you want to do so. Finally, you need to modify the Application Tile by calling the Update method on the found ApplicationTile, passing the newly created instance of the StandardTileData. I decided to create a static class with one method to update the Application Tile. The reason to do so is that this class will be re-used in a few similar, but different applications. The UpdateLiveTile method uses localization and is called each time the user has a high score. The only down side of a localized tile that I can think of is the fact that the tile does not automatically change to another local language when the user changes the language of the device. The tile will be modified if the application has executed one time, but if the application has not been executed, the tile will keep the original local language. The reason for that is that the tile is only updated inside the application, so the application has to run in order to display modified content on the tile. Since I don’t expect users to frequently change local languages on devices, I don’t think this is much of a limitation. In my first post about tiles, I wrote that the Mango update of Clicker will be available with this blog post. Unfortunately that is not the case, so I will make sure to send out a tweet when the updated version of Clicker hits Marketplaces all over the world. Live Tiles have been one of the nice differentiators of Windows Phone. In Mango, Live Tiles even got better, as a matter of facts, way better for end users and for 3rd party application developers. Today, applications can benefit from multiple secondary tiles that allow deep linking into the application. With Mango, all tiles have a front and a back that can contain different information. On the home screen, tiles with information stored on both the front and the back side will regularly flip over to see both sides of the tile. In this article you will learn how even the simplest applications can benefit from live tiles, with the possibility to update the information presented on the tile locally. Each application has at least one tile, the application tile. It is up to the user to pin this tile to the start screen on their phone. By default, this tile is single sided, meaning it will not flip over to show the back to the user. In order to use both sides of a tile, you can initially add the appropriate properties to the WMAppManifest.xml file. The cool part of completely defining your double sided application tile in the WMAppManifest.xml file is that the tile starts rotating immediately when the user pins the tile to the start screen, even if the application has never been started by the user. That is the starting point of this blog entry. One of my sample applications that is available through the Windows Phone Marketplace is a simple game called Clicker. In its original form it of course has an application tile, that simply looks like this. The tile only shows the application title and uses transparency to display some areas using the selected theme color on the phone. Even though this is an acceptable first approach, the end user experience could still be improved. Clicker is a localized application with support for a few different languages. The message on the back of the application tile should therefore be localized as well for the different supported languages. With a little extra effort that can be achieved as well. In order to put localized strings in the manifest file, you need to provide a native resource DLL for each local language that your application supports. 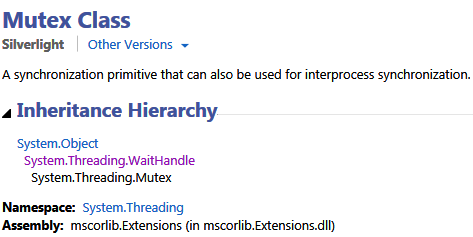 If you are using Visual Studio 2010 Professional or better to develop your Windows Phone applications, you can literally follow the actions that are described in this MSDN How to page. However, if you are using the express edition of Visual Studio 2010 to develop your Windows Phone applications, you cannot create a native Win32 DLL. In that situation, you might be able to use the tool that Patrick Getzman created to localize application tiles. I am not sure if this tool currently supports creating localized BackTitle and BackContent strings though. If not you either have to kindly ask Patrick for support or you can make use of the free Visual C++ 2010 Express version to create the resource DLL. Here are the two different string tables that I created in a neutral language resource DLL and in a Dutch language resource DLL. AppTileBackContent 400 Play clicker and beat your own high score! AppTileBackContent 400 Speel en verbeter je beste score! After changing the WMAppManifest.xml file’s TemplateType5 content to the following, the application tile now appears in Dutch on a Dutch Windows Phone 7.5 device and in US English on any other device. The next blog entry will dig deeper into live tiles and shows you how to update the high score for this game on the backside of the application tile. At that time, the Mango update of the Clicker application will also be available through Marketplace. If you can’t wait to start playing with the application, the current version (without live tiles) is available here for download or at your own local Windows Phone Marketplace. If you want to learn more on how to develop a Windows Phone Application, make sure to take a look at EvenTiles, a series on Windows Phone Application Development with articles, videos and source code available for download.